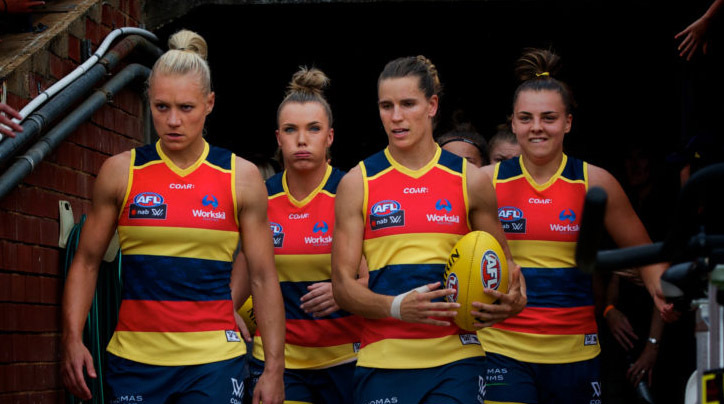 Adelaide’s premiership-winning women’s team will start its flag defence with a Grand Final re-match against Brisbane at Norwood Oval in February. It will be one of three home games the inaugural AFLW premiers will play at the venue, with another to be played in Darwin on a Friday night against Fremantle, as the league today revealed its fixture for the competition’s second season. The Crows will also host the Bulldogs and Carlton in Adelaide, while also travelling to Melbourne twice – including a final-round clash with Collingwood – and taking on GWS in Sydney. Chief Operating Officer Nigel Smart said in a statement the club was “thrilled” to have three home games in SA, with two in the Saturday night timeslot. “To have four home games and three away, including two in Melbourne, is a great result,” Smart said. The second AFLW season will mirror the structure of the first, with seven home and away matches followed by a Grand Final between the two top teams on Saturday, March 24 – in a vacant timeslot during round one of the men’s season. The Crows will also play a trial match in Darwin on Saturday, January 13 before its February 3 season opener. The 2018 AFL Women’s season will kick off with another Friday night encounter between Carlton and Collingwood at Princes Park. Fans were locked out of the venue when the two famous clubs played the inaugural AFLW match in February this year in front of an estimated 24,500 supporters. “This year worked really well, we started really strongly and we were able to maintain that momentum throughout the season,” AFL fixturing boss Travis Auld said. Melbourne will host Greater Western Sydney at Casey Fields and the Western Bulldogs will play Fremantle at Whitten Oval to complete the opening round. The Dockers will host the Magpies in round two in the first sporting event held at Perth’s new $1.6 billion stadium. However fans will be charged admission, while entry to every other match will remain free. There had been a push to expand the finals to include two preliminaries but Auld said the league needed to be mindful of the Australian Open tennis in Melbourne in January and the start of the men’s season. “We had quite a healthy debate around when we start the season and, by default, when we finish it,” Auld said. North Melbourne and Geelong will join the league in 2019 and Gold Coast, West Coast, Richmond and St Kilda will follow in 2020.